These Lemon Pepper Air Fryer Chicken Thighs are quick, easy, and on your dinner table in less than 20 minutes. Juicy moist chicken made right in your Air Fryer. But with this Air Fryer Lemon Pepper Chicken Thigh Recipe, pizza gets pushed on the back burner and this gets made in a jiffy. It’s full of flavor and I don’t have to wait for my chicken to marinate, woo hoo! My chicken thighs still come out juicy and moist and full of flavor. 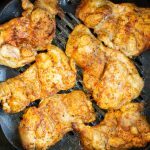 Chicken thighs are one of my favorite pieces of chicken to cook in an Air Fryer. They don’t dry out, they’re full of flavor, and they’re pretty much hands off. How do you cook chicken thighs in an Air Fryer? For this recipe, I start by washing and drying my chicken thighs. Yes, I know the big debate..do as you wish when it comes to washing your chicken. But…make sure they are dry when adding the seasonings. I then season my chicken thighs with my seasonings. For this recipe, I use lemon pepper seasoning, fresh lemon juice, black pepper, paprika, italian seasoning, and garlic powder. Most lemon pepper seasoning by itself just doesn’t move me, so I add to it. 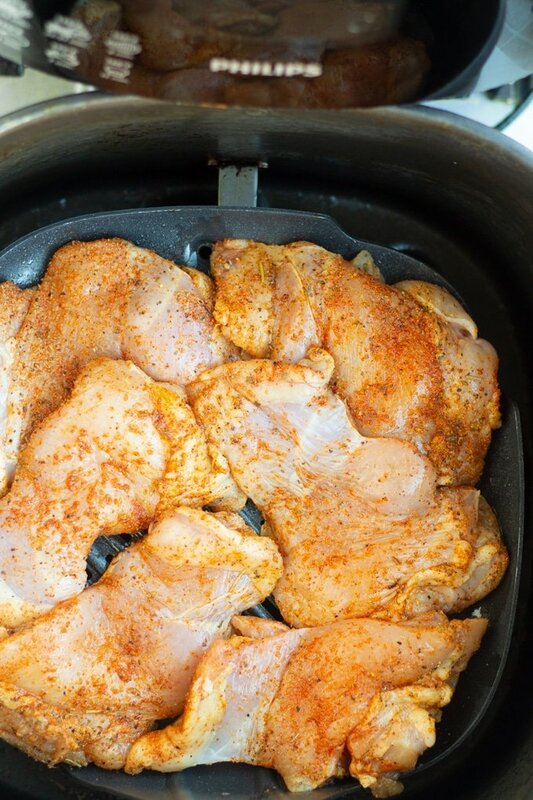 I then place my chicken thighs in my Air Fryer…it’s ok if they touch a little. Bone in chicken thighs: 360 degrees Fahrenheit for 22-25, flipping halfway through. Then crank up to 390 degrees for 5 minutes if you want crispy skin. Then serve and enjoy your delicious moist Lemon Pepper Chicken. 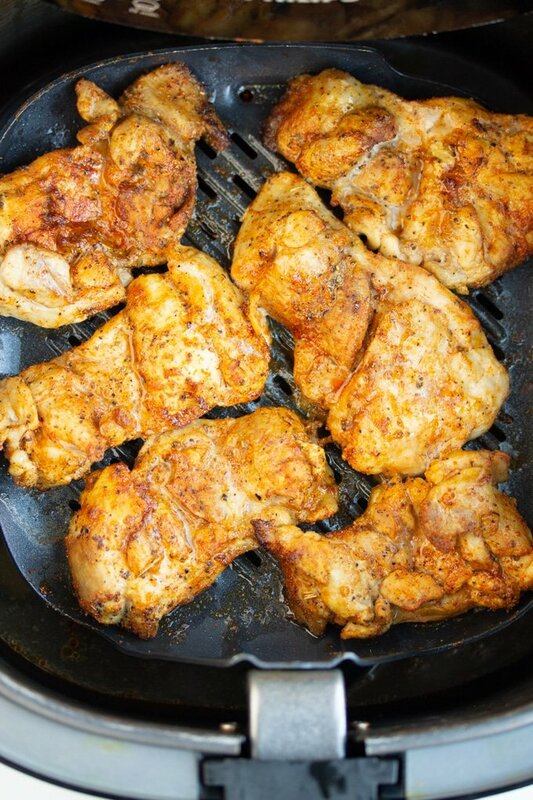 Do I need to spray these chicken thighs with oil? Not this time! I find that some foods need oil while others don’t. Since there is no breading on this and chicken thighs have their own natural fat, you don’t need oil. I talk about this and more in my 10 Air Fryer Tips every Air Fryer Owner Should Know. Will these chicken thighs get crispy? Not if their skinless, because there isn’t really much to crisp. If you want crispy chicken thighs, skin on would work best. I hope you enjoy these lemon pepper chicken thighs as much as we do. Looking for more Air Fryer Chicken Recipes? Try my Crispy Korean Air Fryer Chicken Wings. 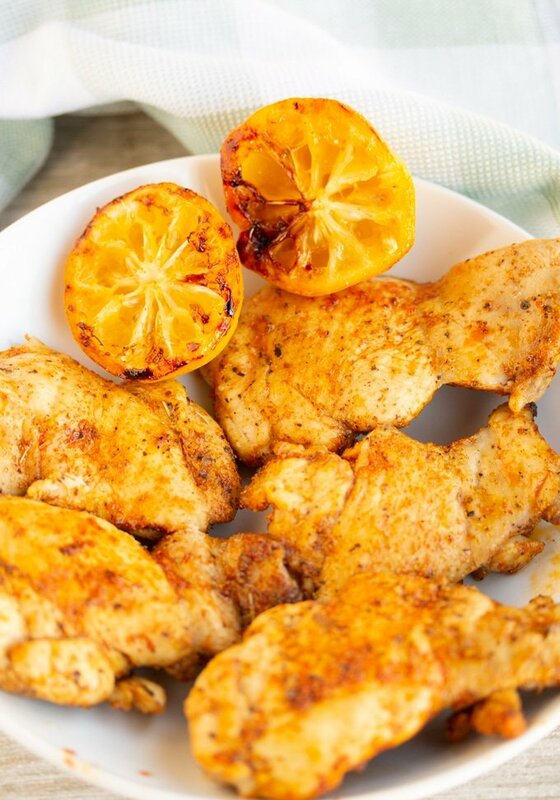 Easy and delicious Lemon Pepper Chicken Thighs that are made in your Air Fryer. 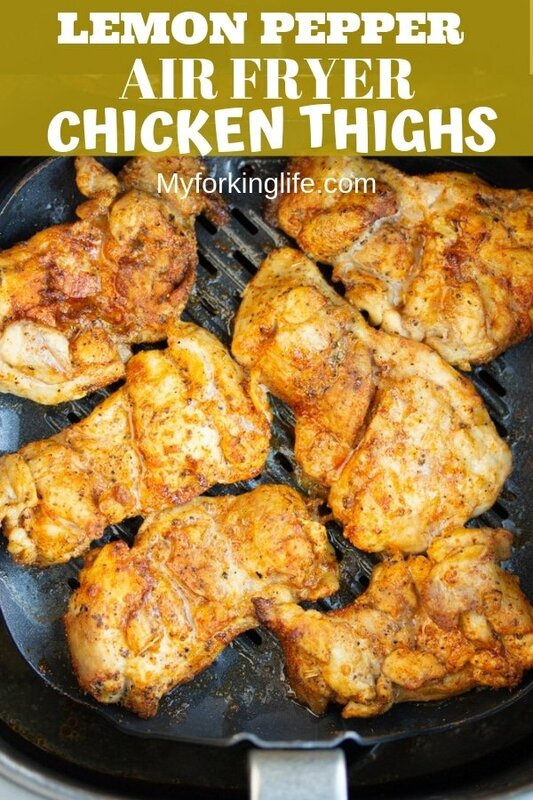 Wash and dry chicken thighs. Rub remaining ingredients over chicken thighs. Place in Air fryer and cook on 360 degrees Fahrenheit for 15 minutes, turning halfway through until the chicken has reached a temperature of 165 degrees Fahrenheit. 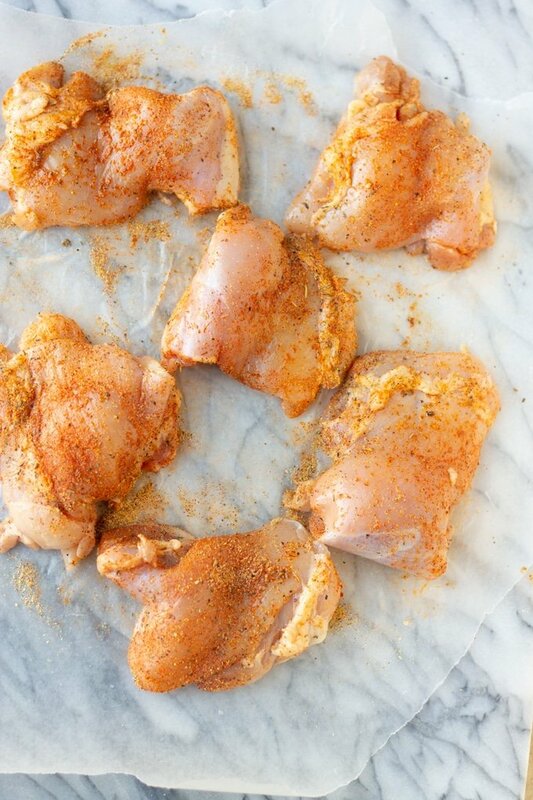 For bone in thighs with skin, increase cook time for 22-25 minutes at 360 degrees. Then cook on 390 degrees Fahrenheit for 5 minutes more. 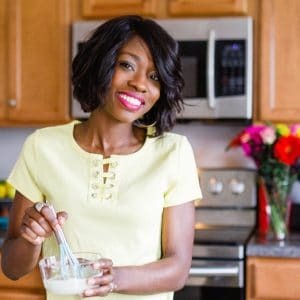 This recipe is so easy and SO flavorful! IT sure was a crowd pleaser! Looks so delicious! I love lemon and pepper combined – such a great dish for midweek dinners! I keep hearing such great things about the air fryer. Might be time for me to break down and get one. This looks so easy! I love the flavor of this chicken! My whole family loved it and is already requesting it again! these sound just incredible!! love how easy they are to make, and great flavor, I def need an air fryer.